On the eve of the 2012 presidential elections, both Islam and Mormonism are becoming increasingly politicized in the public sphere. For President Barack Obama, the myth of his secret Muslim identity is ultimately “coded into political ‘otherness’ – he’s a socialist, he’s dangerous, maybe a Muslim.” GOP Candidate Mitt Romney’s Mormonism, by contrast, is a way for many Americans, particularly secular and non-religious voters, to distance themselves from the candidate: “Mormonism becomes the lens through which they can paint their critique.” However, with the presidential election less than a month away, Billy Graham a leading evangelical figure in the U.S., cut out the word “cult” from his association’s description of Mormonism, although the move was seen as partisanship by some conservative Christians. Ever since its founding, Mormonism, the first American-born religion, has been portrayed as a foreign religion and often defined in opposition to the Protestant majority. Even today, 16% of Americans say that they would not vote for a Mormon presidential candidate due to their suspicion of the religion’s influence on the country. 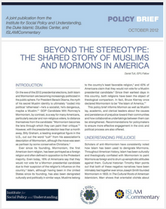 This policy brief informs Mormon as well as Muslim lay, academic, and clerical leaders about the causes and persistence of prejudice toward their communities and how collaborative undertakings between them can be strengthened. Recommendations for policymakers to ensure more effective engagement in the civic and political process are also offered. This policy brief is published by ISPU, DISC, ISLAMiCommentary and the Triangle Center on Terrorism and Homeland Security.